We use oil for many reasons – to protect our bodies, to cook food, to massage tired muscles. Jesus highlights oil in the lamp for the gospel today. Later in this chapter of the gospel he will speak of using wealth and talents well, and of care for the poor. Prayer – no matter what its method, keeps our faith alive, and brings us into deeper relationship with the Divine in our lives. Every great faith – Christian or non-Christian – has its methods and way of praying. 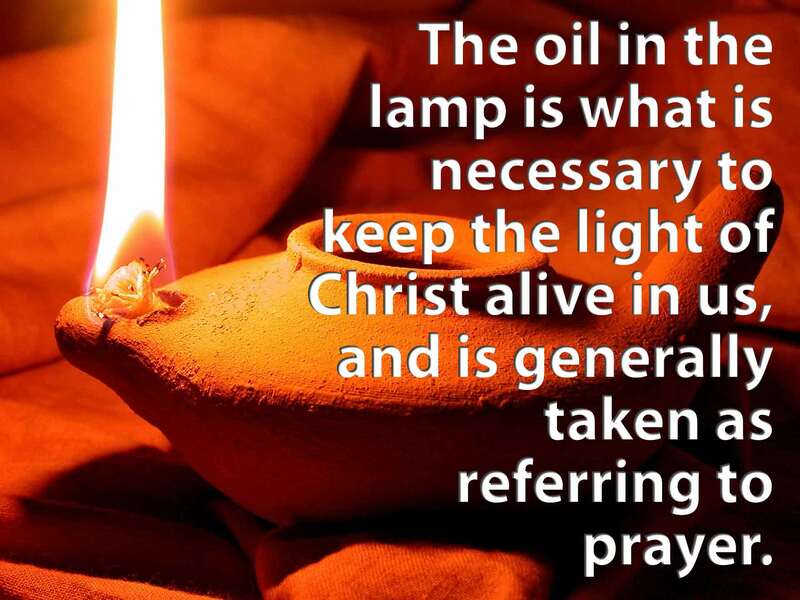 Like oil giving light to the lamp or protecting us from evil, prayer renews energy in the body and soul, and guides our steps in life on the way of Christ. People pray in different ways. I remember an old Irish granny who spent a lot of time ‘telling her beads’ – her way of being in contact with her God and God’s mother. We pray with meditation, with the gospel, in silence. Alone or with others, in the Eucharist. Each of us finds our own way of praying, and that is the best for us. We need to refill at least daily the oil container of our lamp. We can do this particularly in the morning and evening. We can offer the day to God and thank God for it. This is the oil that will smooth our weariness and free us for our gospel way of life. I offer you Lord, this day with its joys and sorrows. I give thanks for what has been good in this day. Amen. This entry was posted in Gospel of Matthew, Gospel Reflection, Liturgy Resources, Prayer Resources, Scripture, Year A and tagged Donal Neary SJ, Gospel Reflection, Gospel Reflection for 32nd Sunday Ordinary Time Year A - November 11th 2017, Jesus, Matthew 25:1-13, Prayer, Sunday Gospel Reading and Reflection.